Virtual reality consultant Lisa Laxton has worked with both NASA and the U.S. Navy. 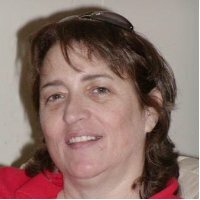 She is a NASA STS-86 Space Flight Awareness Launch Honoree and recently worked on projects with a Navy team that raised the bar for future development using a variety of technologies for spatial analysis, 4D simulations, and scientific visualization. Lisa Laxton: That is a good question! I am not sure I can give a short answer. It is hard to pin down when I got started but when I was at working at Johnson Space Center, I worked in several different areas to support Space Shuttle Operations and the design and build of the International Space Station. After supporting simulations in the Shuttle Avionics Integrated Laboratory, I had the opportunity to support the Visual Simulation Systems in the Integrated Training Facility — previously called the Shuttle Mission Simulators — during that time. In that facility, we had a full size mock-up of a Space Shuttle we called the Fixed Base Simulator and a full size mock-up of the cockpit mounted on a movable platform we called the Motion Base Simulator. In both cases, there were six forward windows, two payload bay windows, and two overhead windows. Custom visual software and hardware projected images onto or into window-size lenses so that the image viewed from inside the simulators was as realistic as possible. Astronauts trained using these simulators for every possible scenario from launch to payload deployment to landing. That meant a virtual scene of every launch and landing facility was necessary as well as simulating the cameras on the robotic arm and boom. The Motion Base combined visual simulation aspects with physical simulation aspects while the Fixed Base was often used for simulation of on-orbit operations as well as full flight durations. My favorite shift was the graveyard shift because we had to verify all visual simulation systems were fully operational each morning before the crew arrived or woke for training. There is no video game or virtual world in existence that can replicate that experience, but we can get close with virtual and mixed reality if we can evolve the technology into the future by thinking out of the box. Virtual world technology as we know it today, began with these simulation concepts. I went on to support communications and visual systems for the Weightless Environment Training Facility and to support Mission Control as an engineer responsible for flight critical systems. During my time supporting the crew and Mission Control, I was humbled and honored by the STS-86 award. While I was having a great time at NASA, I was also greatly interested and involved at the beginning of virtual world technology online, occurring in parallel time and supported by both NASA and NIST. Early inspirations began with Active Worlds, Moove, Cybertown, Blaxxun, There, Second Life, Vivaty, Exit Reality, Entropia, Unreal, and more. Each of these explored a different path in technology, all equally interesting. But standards were needed to move things forward for everyone around the world and served to help everyone resolve issues. We saw standards developed like VRML which evolved into X3D and we saw IEEE begin working on standards associated with virtual reality. Tangential efforts include Building Information Models, GIS, OGC, and so on. Because of these standards, modeling and simulation arrived with the growth of standards compliant 3D modeling applications and capabilities. As bandwidth became more available and hardware capabilities evolved for typical Internet users, we also saw WebGL evolve and format conversion tools were developed that allowed more people with less training to become active in virtual worlds driving the coming gig economy associated with virtual worlds. This is not particularly limited to consumer markets or even education markets. Drivers of adoption almost always come from industry and often from government funded development associated with analytical uses in training, engineering, logistics, space, defense, and science. As such, commercial viability and sustainable technology factors are directly correlated with standards. Being a fan of open source and early adopter of virtual world technology, I joined the Open Simulator community evaluating and testing multiple versions from an engineering perspective and felt it showed great promise. I began supporting the U.S. Army’s Military Open Simulator Enterprise Strategy project shortly after it began for the above reasons — to help advance the technology for everyone. I believe we have once again arrived at technology crossroads where inter-grid interoperability standards need to be developed to move the technology into the future. Laxton: I have worked on far too many projects to list. Some of them are sensitive and some are under non-disclosure agreements so I can’t talk about all of them. I’ve done everything from organic and inorganic modeling to behavioral scripting to scientific visualization. I have experience with just about every virtual world or virtual reality technology to date and am looking forward to what we can evolve together in future technologies! On the personal side, I am greatly interested in realism when it comes to virtual world simulations, particularly physics. Math is my thing. It is far more challenging from an engineering perspective to simulate reality than it is to simulate fantasy. I do have an artistic and social side as well and have been hoping we can get to the point we have a safe, secure way to operate virtual world “grids for good” — we are not there yet but will be soon! Creative Commons content and source code is a great start to addressing cost barriers but it is not the total solution to all issues. 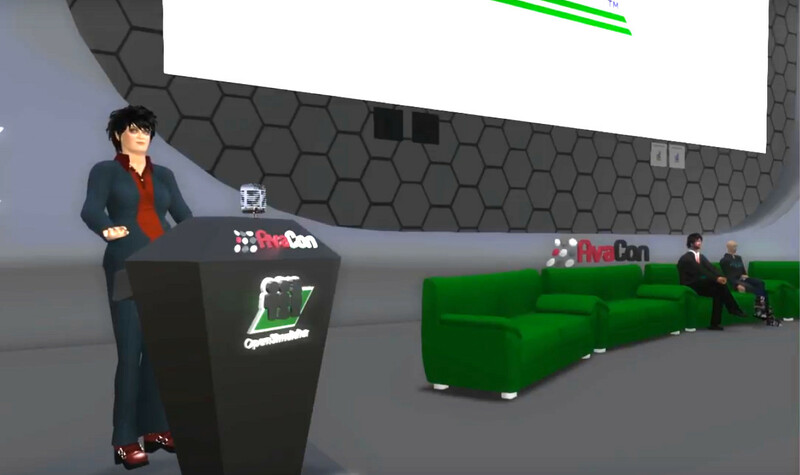 On the professional side, I specialize in modeling, simulation, and analysis, which means using virtual reality tools and methods to simulate reality for the purpose of analysis. Let me describe a couple of projects that are not traditional in the sense of virtual world applications. First, there’s 1940’s dry dock available, but it was never designed to facilitate building an aircraft carrier in the 21st century and Congressional budgets prohibit the construction of a new dry dock facility. The solution was to model the facility, equipment, bathy, and vessel and then provide an analysis of operational challenges seen using the virtual model. During the analysis, it became evident that extremely costly challenges needed to be overcome. A visualization tool was developed to demonstrate out-of-tolerance conditions with regards to frame and deck of the carrier, dry dock elevators, flight deck, aircraft elevators, hull, crane path, and ship listing collisions when shipbuilders go to “float the boat”. This visualization was presented at the Shipbuilder’s Conference in Norfolk, identified issues that had not been foreseen, and led to extensive cost savings for the taxpayers. In another case, Congressional budget cut dictated “no new piers,” which prompted a decision to choose a facility for a new fleet of ships that may or may not be viable. The solution was to model the facility, and provide an analysis and visualization of ship draft to determine level of dredging required and any spatial issues identified during analysis. 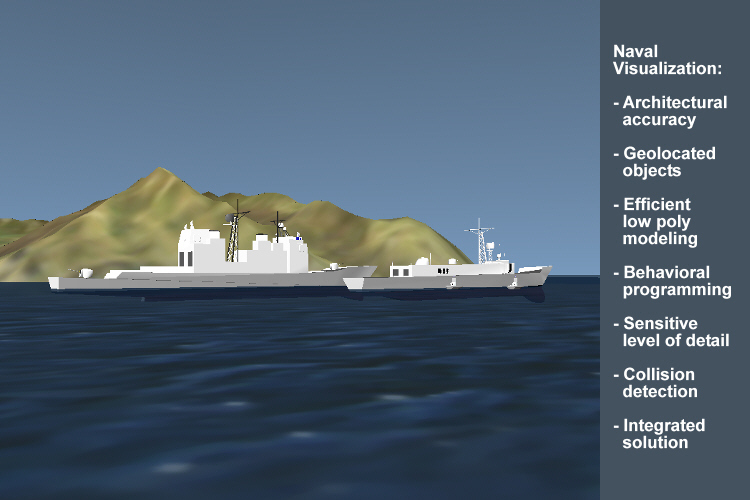 In this case, a full fleet of vessels had to be rendered in the 3D scene simultaneously without lag to provide interactive visualization based on the analysis. Tides had to be simulated and up-to-date bathymetry had to be analyzed to model the bathy within the chosen facility bounds. The analysis allowed the customer to determine another facility needed to be chosen due to prohibitive costs of dredging. Some other virtual reality consulting projects were: limited load and unload time analysis for unique vessels based on tidal changes, spatial analysis for vessel mooring at multiple locations, dual deck floating pier design modeling, spatial analysis for engineering and logistics associated with proposed aircraft hangar design, providing visualization of Naval operations, accident recreations, crime scene visualization, creating and updating 3D library content, authoring and modifying scripts to customer specification, anthropological visualization with avatars, virtual world vehicle scripting, physics simulations, supporting University efforts for SIGGRAPH and War Games, and facilitating and moderating virtual worlds for multiple companies and non-profit organizations. What advice do you have for women entering the field of virtual reality? Laxton: My first piece of advice is to find your niche within the niche market of virtual reality. Decide whether this is a career choice or a hobby. For those making it a career choice, realize that women in virtual reality face many of the same challenges women in traditional male occupations face. While social aspects of virtual worlds have some equality for women in virtual reality, we have not advanced far enough as a society yet to be viewed and treated equally in all professions. If you are moving from hobby to career, be prepared for a bit of a culture shock. My second piece of advice is to envision the greater field of view and find ways to think outside the box. Almost everything I have done involved doing things in a way either none had accomplished, some had failed, or many had not envisioned. Be your future and never let anyone tell you that you cannot be because that’s the way it’s always been. Approach every project as a problem-solving exercise with a solution waiting for you to discover it. I hope to help you along your journey with an upcoming venture for the community that I am involved in at the moment. More to come soon. Lisa Laxton at 2016 OpenSimulator Community Conference. Laxton: Last year, I worked on research project support using Open Simulator. The research required a full disabling of the user interface and development of a master control script to control all events in world without overloading the tablets running the viewer and server.